The 1TB drive is £103, the 2TB drive is £204 via Amazon. If you're looking to upgrade your SSD (or even that outdated HDD) in your gaming PC, now is absolutely the time to do it. 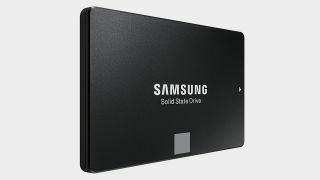 Amazon UK has knocked off a massive amount of money for both the 1TB and 2TB Samsung 860 EVO drives, making both the cheapest they've ever been in the UK by some distance. Right now you can get the 1TB drive for £103, and the 2TB drive for £204. Both represent roughly 60% savings on the recommended retail price although, in truth, neither drive has been that price for some time. We recommend the 1TB version as our best SSD for gaming, as it's the SATA drive that best balances price with performance right now. If you're looking for performance, we thoroughly recommend both drives. In fact, we did so at their higher prices, so they really do represent excellent value right now. You're looking at 550/520MB/s read/write speeds (sequential IO), and excellent reliability as this is a Samsung product. They're the quickest SATA drives you can get, and they're compatible with most PCs, so you don't necessarily need the newest motherboard to upgrade your storage here. In our mind, it tops this deal from last week, where you got a free copy of The Division 2 with every 500GB Samsung SSD. Just.